This post is not sponsored or commissioned by any financial institution. Any opinions, analyses, reviews or recommendations expressed in this article are those of the author’s alone. This post is for college graduates that have high monthly payments for their federal student loans and can’t afford them. You’re not alone! Most of us wish our student loans would magically disappear. For some, this is a real option if you qualify for a federal program. Besides the forgiveness programs by the government, if you have a regular job, there are still federal programs that can help, and some even offer forgiveness after 20 years. When you graduate, you are automatically enrolled in a Standard Repayment Plan which has you paying off your loans in 10 years with fixed payments. The average student loan payment is $393 for those between 20 and 30, and payments can go much higher, making some monthly payments almost as much (or more) than monthly rent! You have options though. If you have a federal loan, there are 4 options you have to reduce your monthly payments, which we’ll go over in this post. They all fall under Income Driven Repayment (IDR) Plans, here is the official federal government website where they go into more detail. Basically all of them reduce your payments based on your income. We also pasted the graphs we found helpful below. 1. 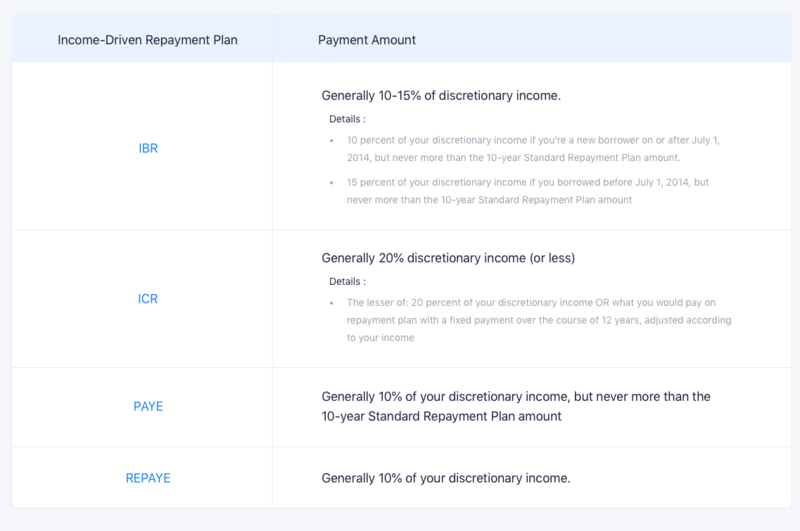 Income Based Repayment (IBR): Payments are capped at 10% of your discretionary income. If you received a loan on or after July 1, 2014, IBR caps payments at 10 percent of your discretionary income. These borrowers will also receive forgiveness after 20 years of repayment. If you received a loan before July 1, 2014, IBR limits payments to 15 percent of discretionary income. These borrowers will be eligible for forgiveness after 25 years of repayment. 2. Income Contingent Repayment (ICR): Functions similar to IBR but you pay a higher percentage of your income towards your loans. BUT the nice thing about ICR is that the borrower’s income isn’t a requirement for eligibility. So, if you were rejected for IBR or other plans, ICR may be your best bet for reducing your monthly student loan payment. Monthly payments are calculated at 20% of your discretionary income, which may or may not be lower than the Standard Repayment Plan you currently have. This plan offers student loan forgiveness after 25 years. You must prove that you need assistance in repaying your student loans and have received disbursement of a Direct Loan after October 1, 2011. Your prospective monthly payments must be smaller than your standard payments in order to qualify for PAYE plan, which are calculated at 10 percent of your discretionary income. 4. Revised pay as you earn (RPAYE): This plan was introduced in December 2015, and is the most interesting since it includes an interest subsidy! Monthly payments are capped at 10 percent of your discretionary income. You can use the REPAYE plan even if your monthly payments are higher than they would be on a Standard 10-year plan. Also – REPAYE offers student loan forgiveness after 20-25 years. REPAYE also includes an interest subsidy that can be a huge benefit for borrower with monthly payments that don’t cover interest charges. If on REPAYE, 100 percent of unpaid interest each month is paid for on subsidized loans and 50 percent of unpaid interest is subsidized for unsubsidized student loans. Eligible loans: All Direct Loans, Stafford Loans, and Graduate PLUS borrowers are eligible for REPAYE, as well as other federal student loans that are consolidated into Direct Loans. 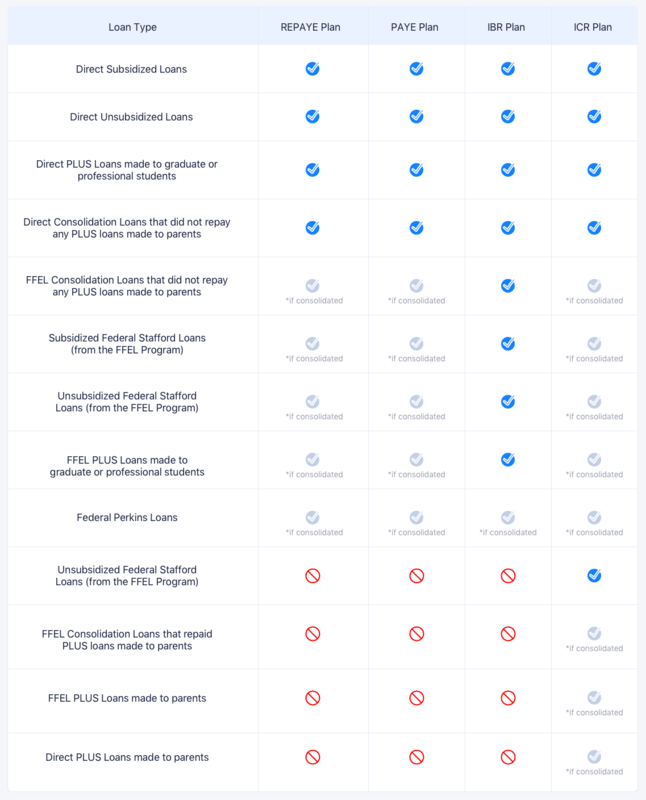 Which one of these Federal Student Loan programs are you eligible for? What’s the breakdown of Payment Amounts? What’s the breakdown of Repayment Periods?